hyati Trehan is a student from India, studying graphic design and she has recently completed her internship at the Think Tank Team of Samsung Research, led by Pranav Mistry in the Silicon Valley, California. Firstly, we have to point out, based on her research and words, that she seems to be far more than another common student of Graphic Design. 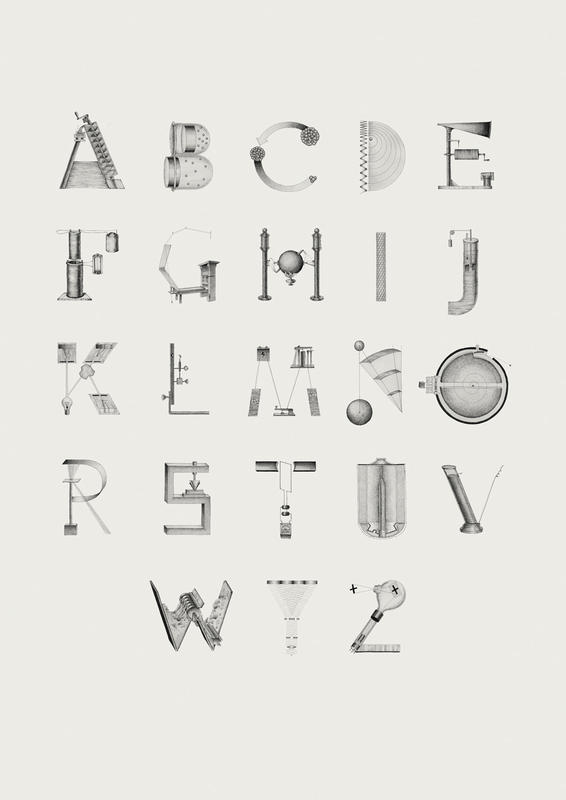 What drew our attention in her portfolio was a project focused on typographical metaphors of various scientific inventions, which work either as infographics or as tribute posters for significant inventors. Since then we’ve become curious about her case and we’ve wanted to learn more about her, like what was hiding behind her idea? Why does she find interest in science and what has she learnt so far from a project like this? So, we approached her for details! The answers that we got are really encouraging and inspiring for everyone, especially students, who would like to engage with typography. Could you provide us some details for your background? I am from New Delhi, India and am currently in my final year of studying Graphic Design at the National Institute of Design, Ahmedabad, India. For my final project, right now I'm interning with the Think Tank Team of Samsung Research, led by Pranav Mistry in Silicon Valley, California. Apart from that, I love singing and hope someday I'll be able to merge these two passions. Could you explain us the project? How did the idea born and how did you get inspired? The idea that the project stems from is something I'd done in the past. The course was Advanced Graphic design, and the brief was to make a poster on a non-designer. Around that time, I happened to be reading a book called the 'Ten beautiful experiments' and was stuck at a chapter about William Harvey, a physician who explained blood circulation accurately (blood was thought to flow to and fro like tides before this). I was referring to heart diagrams to understand the chapter better and I stumbled on one that looked a lot like the infinity symbol. From assignment in letter integration earlier, I remembered thinking that the letter 'W' looked so much like the infinity symbol. I mentally combined these two occurrences to integrate W, the initial of William Harvey, and the blood circulation diagram that Harvey discovered and found the subject of my assignment without even looking for it! When I was making the brief for my 2-month long classroom project, I felt I should do justice to this idea and complete the letter set if possible. The task of arriving at 26 letters seemed daunting, knowing that it is close to looking for a double coincidence of wants (like in barter system); the skeleton of the initial of the scientist should be similar to the diagram that they made, and the diagram should have a structure similar to that of the letter concerned. The project was therefore to explore scientific diagrams and take form integration to more complex territories. It looked at experimenting with typography, lettering and illustration, paying tribute to the history of science. Do you think that handling with typography is a way for experimenting and learning? How typography helps you to improve your skills? This is going to be a bold statement to make but I've come to learn that typography is most of Graphic Design. Nothing broadly sums up the roots of graphic design as well as type does. Handling and experimenting with typography and type design teaches too much at one time. Working with type may a) train your eyes to observing subtleties b) give you an understanding of form, negative space and positive space c) require you to understand the history of type since the field is strongly tied to its roots d) teach you how what you're making should be used; essentially typography. The knowledge of this will eventually aid publication and use of type on the web e) teach you to unite entities in a system; all characters should belong to the same family. The same thought process is bound to find use in branding systems. I've been trying to explore all possible nooks and crannies of visual communication and type keeps showing up everywhere. Typography and science. How do you link these two words? Typography can be linked to anything that needs to be understood and made visible. I chose to make scientific diagrams understood using lettering and illustration. One of my biggest realizations during this project was how ingeniously simple popular science concepts were and yet they've been presented to us in unnecessarily complex ways. Within the field of Graphic Design, this was a truly 'learning by doing' experience as it was both, labour and research intensive. Do you have any ideas/plans for creating a project similar to that in the future? In general, what fields are you going to explore this time? What is perceived here is lettering, but in fact, the project involved flexing illustration and form muscles more. I could have tweaked the diagram to become triangles or squares but molding them into specific letters that are more recognizable forms, gave the project additional layers of meaning. Since this project, I've fallen in love with creating meaning through finding relations between seemingly unrelated things and continue to look for connections between concepts and forms. After this project, I wanted to learn about type design and got the opportunity to intern with The Indian Type Foundry. But really developing the sensitivity to design type requires way way way more investment of time and effort. In the future and now, I want to continue playing with beziers and practicing drawing letters. Gerard Unger, the entire cast and crew of Commercial Type Foundry, Satya Rajpurohit and Sanchit Sawaria. What is the best advice you have been told/read so far? You get the best ideas when you're not thinking about them. Khyati thanks a lot for your time! You can view more of her work here.